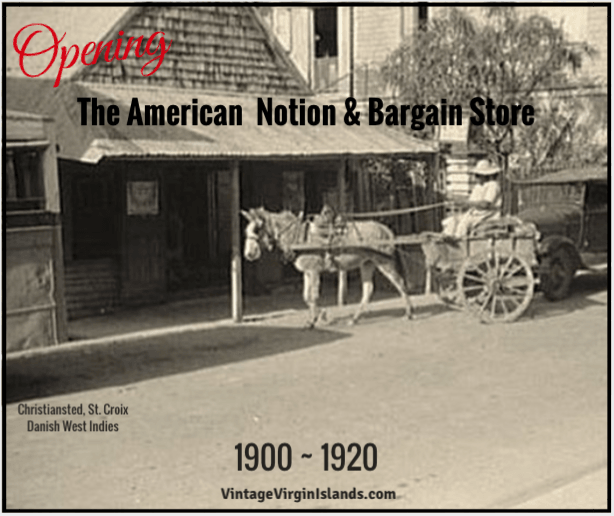 Ever wonder what the mom-and-pop stores sold in the Danish West Indies? Our forefather opened several stores in his lifetime, each with an eclectic collection of items from various places around the world. 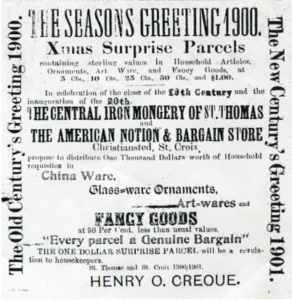 On August 4, 1900, Henry O. Creque opened a store in St. Croix. It was called The American Notion and Bargain Store. Located on 40 Kings Street, it was in the heart of Christiansted’s main commercial district. 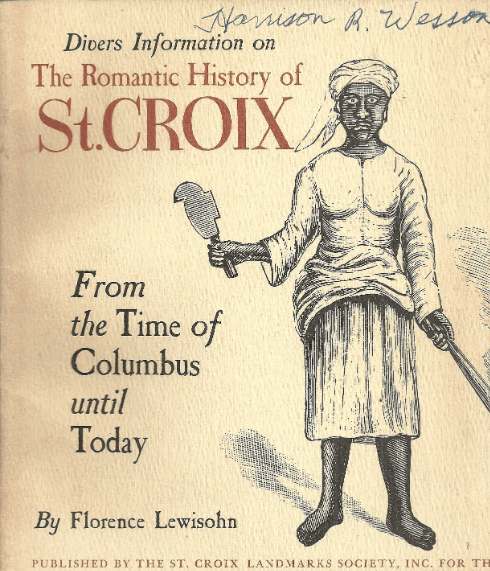 The various ads he placed in the St. Croix Avis and the Bulletin during that time period reflected a vast array of products for sale. Other items included American-made footwear for each member of the family, children’s toys, china, glass, earthenware, and ornaments for the seasoned shoppers. Foods imported from Canada, like codfish, hake, haddock, herring, butter, and potatoes made up the rest of the inventory. Mr. Creque routinely promoted his store, offering specials throughout the year and Christmas bargains during the holiday season. He commemorated his first year in business by decorating the store with bunting and letting the local newspapers know about it, to capitalize on a little extra advertising. He was a keen businessman and took great pride in the quality of the goods he offered at the St. Croix location. Henry made countless trips between St. Thomas and St. Croix in a given year. Many of the supplies were shipped directly from his St. Thomas warehouses on the schooners, Vigilant and Viking. Fifteen years after the store’s opening, Henry passed away from heart complications. 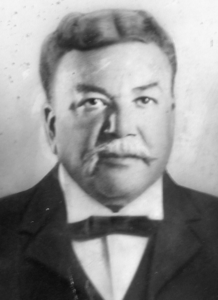 His son Herman, inherited his father’s properties and began managing both the Creque Marine Railway, as well as the other stores on St. Thomas and in the British Virgin Islands. 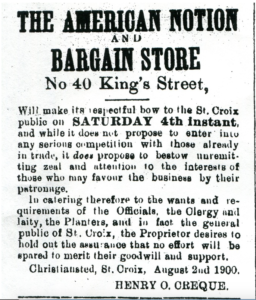 Five years after his death, The St. Croix Herald announced that the store on 40 Kings Street would be closing on July 31, 1920.